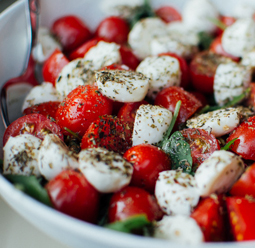 Tomato-Mozzarella Salad with La Tourangelle Basil Oil - A recipe from Savor California, the online showcase for extraordinary gourmet foods and beverages from California. Combine lemon juice, basil oil, salt and pepper. Combine tomatoes, cheese and dressing in a bowl and season with salt and pepper, to taste. Garnish with a few torn basil leaves, if desired.